506 E Van Cleve St. Please contact the health department for further information and to see if your child will require additional vaccines for school entry. Parents bringing children for immunizations need to bring their shot records from other medical providers. If not accompanying your child to the clinic, a permission note that your child may receive vaccines is required. Please be prepared when scheduling the appointment, to provide Medicaid numbers, private insurance information, Hoosier Healthwise numbers and any other pertinent insurance information. Immunizations are free for those children with Medicaid, while claims will be filed with insurance companies when applicable.Those children without any vaccine coverage will pay $5.00 per vaccine. 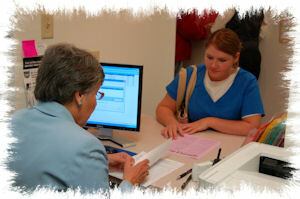 Immunization Clinics are held each Monday and Wednesday, unless it is a holiday. LIMITED AMOUNTS of FLU VACCINES (SHOT OR MIST) ARE STILL AVAILABLE for children and adults. Please call 348-4317 to schedule all appointments. Hartford City - Call for Dates. Dr. Lori Skidmore has was appointed Blackford County Health Officer in 2012. She graduated from DePauw University in 1984 and the IU School of Medicine in 1988. In 1991, in Fort Wayne, she completed her Family Practice Residency after which she began private practice in Montpelier, IN. Since 1991 she has been a member of the Blackford County Hospital Medical Staff. For 8 years she served on the Blackford County School Board. The Emergency Preparedness division is responsible for developing the department's emergency plans and protocols for any natural or man-made disaster that may occur. Along with developing plans for surveillance for diseases, mass prophylaxis, mental health in disasters, and many others, the local public health coordinator serves as a liaison with many other community agencies responsible for disaster planning. The health department is a primary supporting agency for coordination of health and medical response within the Blackford County Comprehensive Emergency Management Plan. Volunteers may register by completing the volunteer form. Click here to link to VIS (Vaccine Information Sheets) on all the above vaccines available at the Health Department. The Health Department uses the CHIRP (Children and Hoosiers Immunization Registry Program) which tracks the child’s immunization that are given. Copies of children’s vaccinations are available for no charge. In addition to the vaccine program the public health nursing division is responsible for follow-up investigations on communicable diseases in Blackford County, this includes but is not limited to lead testing and follow-up case management of children with elevated blood lead levels, TB (tuberculosis) testing and follow-up case management of individuals with active or latent TB. The Environmental Health Section is responsible for investigation and correction of conditions within Blackford County which influence the health and safety of the community. Performance is based upon information received and interpretation of Indiana Administrative Codes, regulations and ordinances. As agent of the local health officer, the environmental health specialist reacts to adverse conditions within the community with the purpose of correcting health hazards. To read and/or download local ordinances and applications, click on the listed links for a pdf version of these documents. Click on the following link to access Indiana Government resources. Needed immunizations are discussed with a client or parent/guardian of a client and they are given an opportunity to read the VIS (Vaccine Information Sheet) for each vaccination needed. A program is presented to all first graders in the county about tobacco usage. Pictured below is a puppet show about the undesirable effects of using tobacco products. Programs are provided to Head Start children about nutrition. Fruits and veggies in their natural state are shown to the children and their benefits discussed. Samples are distributed for the children to taste. The Vital Records division is charged with the responsibility of collecting, preserving and certifying records of birth and death that have occurred in Blackford County. Certified copies of birth and death records may be obtained for those events that took place in Blackford County only. Certified copies may be obtained on a walk-in basis or by mail. Please allow 1-2 days for processing time for mail in requests.